It’s amazing how the weather can affect one’s mood. The off-and-on winter/spring weather has been frustrating enough, but nothing dampens my spirits more than waking up in the morning, looking out the window and seeing nothing but grey skies. No sun, no rain, just bleak, somber skies. Even though it’s Good Friday and we have no intentions of doing a lot today, it’s sort of off putting. 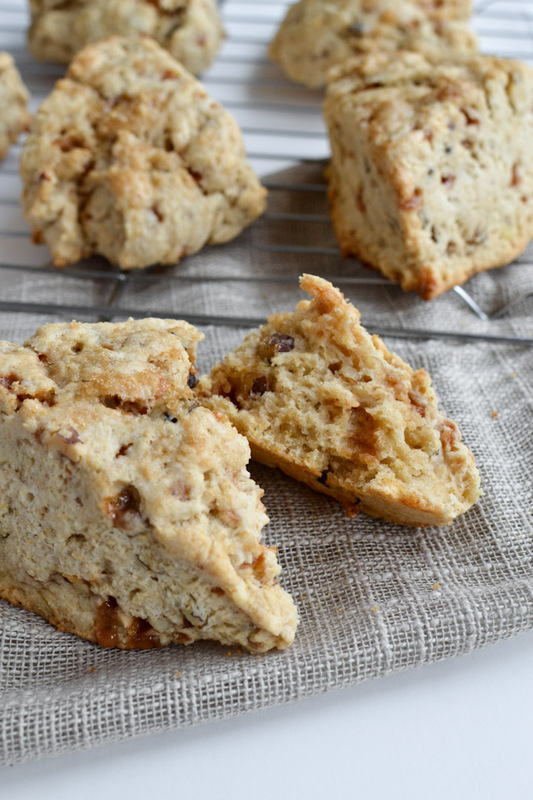 So naturally, after I was greeted by grey skies this morning, I knew I had to bake something special for breakfast and these skor toffee scones were just the answer. I splurged and used cake flour in place of some of the flour and butter in place of my usual margarine. Instead of sugar, I substituted pure maple syrup. Right before I baked the scones though, I brushed them with a bit of milk and sprinkled a little brown sugar. 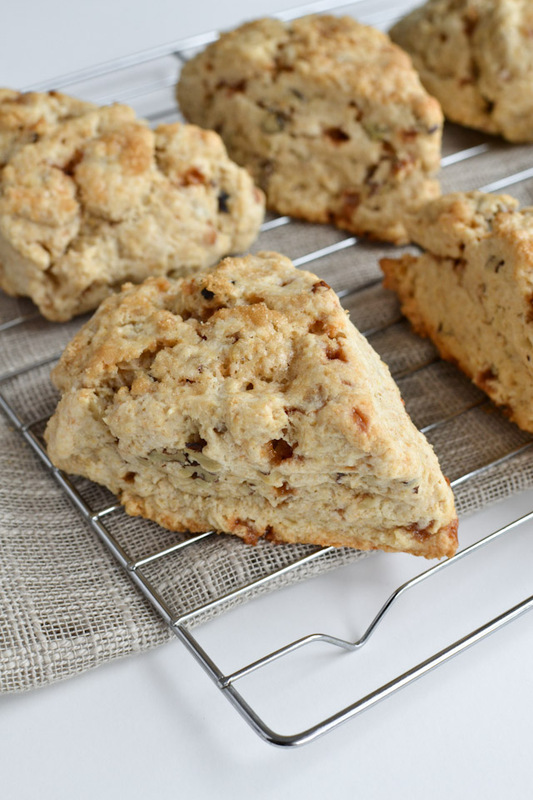 I’m pretty sure that last part is the secret to all scone-making because the result was flaky, savoury scones with a delicious crunchy sugar top. 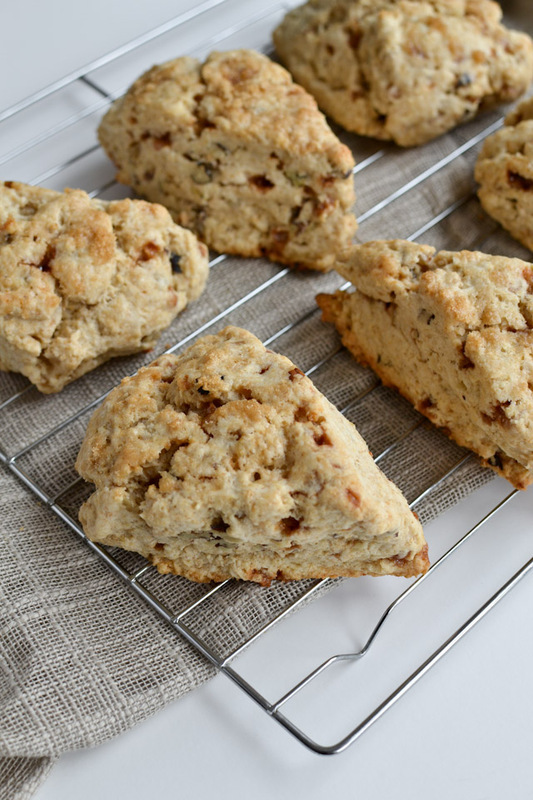 Sometimes I can’t believe that in the three years I’ve been blogging, I only have six scone recipes. Note to self – make scones more often. If your view looks anything like mine, I recommend shutting your window blinds and curling up on the couch with a good book, hot tea and these scones. At least that is my plan today. Preheat your oven to 425*F and line a baking sheet with parchment paper or a non-stick silicone baking mat. In a large bowl, whisk together whole wheat pastry flour, cake flour, baking powder and salt. Cut in the butter/margarine with a pastry cutter until the mixture is coarse. Add maple syrup, milk, Skor Toffee Bits and chopped walnuts and stir until the dough comes together. Form the dough into a ball and gently pat into a 6 to 8 inch circle. Cut the circle into 8 wedges. Place the wedges on your baking sheet, leaving enough space between each wedge. Gently brush the top of each wedge with milk and sprinkle with brown sugar. Bake for 12-15 minutes until the top of the wedges are a light brown. Cool for a minutes on the baking sheet and transfer to a wired rack to cool completely. Enjoy warm with butter or jam.